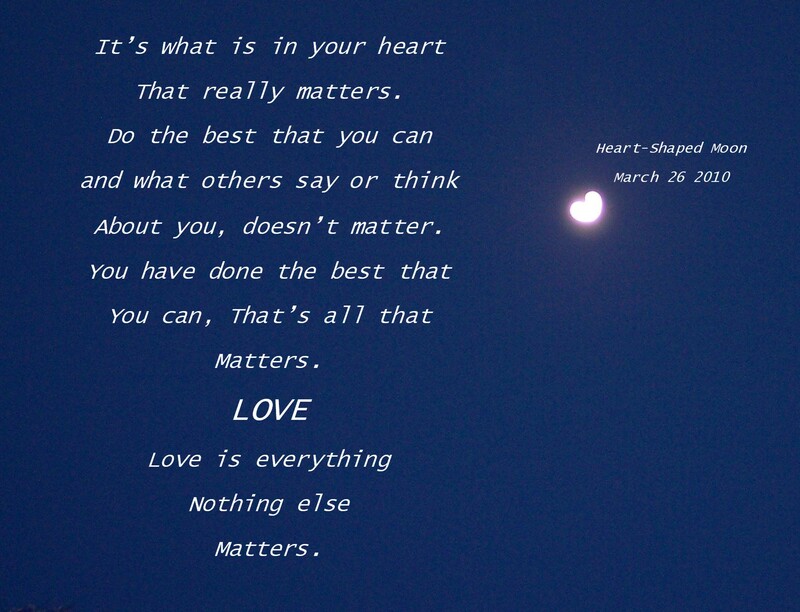 What’s in your heart is all that matters. My New Years resolution is to hopefully, share with everyone on earth our true purpose here on earth, why we are here. Anyone who has read my blog or visited our website www.oursonbilly.com will have an idea of what I am about to write about. Since the loss of our son Billy in 2004, one of my goals has been to try to connect with our son Billy in heaven, which we have been able to accomplish in different ways. Here are to name a few ways that we have been able to connect with Billy, spirit medium, dreams, blinking lights, Billy playing around with our computer, messages from Billy and the most common way that we have been able to connect with Billy are through our spirit photographs that we have and continue to take. Here are a few, spirit orbs, spirit essence, streaking lights and our favorite the heart-shaped images of the moon, street lights, christmas tree lights. Which brings me back to the true purpose of why we are here? Billy has helped me with this message of why we are here, through the heart- shaped images in our spirit photographs, – LOVE – love is the reason why we are here – meaning – How we treat one another and that is how we grow spiritually. That is our purpose here on earth. LOVE – How we treat one another, no matter what religion or no religious beliefs at all, no matter what the color of your skin is, or if your rich or poor, famous or just your average Joe, male or female, young or old, it doesn’t matter what you do for work, or what country that you are from, or anything else that you can add to this list, it just doesn’t matter, because LOVE is everything and nothing else matters. It is all about how we treat every single person in our lives and every single person that we come across and every person that we talk about in our lifetime; it doesn’t matter if you have known this person for a lifetime or for a very brief moment, or never knew the person that you came across. Everything that we are here to do revolves around how we treat every single person that we come across in our lifetime, and how we treat that person can make a difference in their life and they in turn can make a difference in someone else’s life and so on. One person at a time, that’s where it begins. After all, WE are all part of one family – LOVE IS EVERYTHING AND NOTHING ELSE MATTERS.